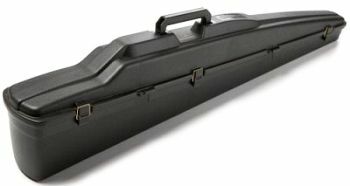 Among injection-molded plastic rifle cases, Plano’s AirGlide™ case is unique in holding a rifle vertically, in foam cradles. This allows ample room for the 3"-wide fore-ends on BR and Varmint rifles. The foam blocks front and rear can even be trimmed for a custom fit, while velcro webbing straps hold the rifle securely. The AirGlide’s hinged top-opening lid provides ample clearance for large target scopes, with no side load on the turrets. (We’ve found that some eggcrate foam-lined gun cases can put enough side-pressure on scope knobs to alter your zero.) There is also enough clearance that you can keep your rifle wrapped in a rust-fighting Bore Store synthetic bag, inside the AirGlide. (Storing your rifle for a long period in a conventional foam-lined gun case is a bad idea because the foam will absorb moisture and actually promote rust.) Measuring 51 1/2"L x 7 3/4"W x 12 1/4"H, the AirGlide can easily handle rifles up to 50" in length. That should hold BR rifles with barrels up to 29". Priced attractively, ($29.97 at Sportsman’ Guide), the AirGlide has proven very popular with Varmint shooters and BR competitors. We’re told that, at last year’s West Pennsylvania Groundhog Shooting Championships, 30% of the competitors stowed their rifles in Plano AirGlides. Lockable and airline-approved, the Plano AirGlide offers excellent performance for the price. • Color: Black | Dimensions: 51 1/2 x 7 3/4 x 11 1/4"